To understand this historical trajectory, the International Strategy Center interviewed Park Ji-ah, Vice-President of the Seoul Women’s Association and President of the Gender Equality Education Center. Park has been a part of the feminist movement for over 20 years doing education around sexual violence as well as directly mediating and resolving such incidents. The following is an edited version of the interview. Starting with the 2016 Gangnam Station murder all the way through President Park’s impeachment in 2017, feminism’s voice has become stronger in Korean society. Recently, after Prosecutor Seo Ji-hyun televised interview of her sexual harassment, the #MeToo and #WithYou movements rapidly spread in the judicial and culture and entertainment sectors. #MeToo has radically changed the previous ethos of hiding and covering sexual violence. In Korea, much like the rest of the world, the #MeToo movement created the space to bring forth one’s experiences of sexual violence demanding to be shared with the world. Nonetheless, it is important to recognize that the movement against sexual violence has always involved a victim coming forward to expose the truth, fight the problem and change the system and the laws. The chair of the Ministry of Justice’s Task Force Against Sexual Crimes investigating Seo Ji-hyun’s case, Kwon In-sook, is herself the protagonist of a historic case of police sexual torture. In 1986, during Korea’s dictatorship, during heavy repression of the democratization movement, Kwon, a college student at the time, joined the labor movement and became a factory worker. When her educational background and organizing were exposed, she was arrested and sexually tortured. Her high profile case and then victory dealt a heavy blow against the moral ethos of the dictatorship. In 1991, Grandma Kim Hak-soon was the first to come forward as a sexual slave of the Japanese military. She fought against a Japanese government denying the existence of sexual slaves. In the process, she sparked a movement that continues after her death in 1997. In 1993, a teaching assistant referred to as Woo lodged the first workplace sexual harassment lawsuit against a professor known as Shin. Her victory after six years of legal struggle led to the first workplace anti-sexual harassment law. Is there something particularly Korean about sexual violence here? Of course differences in culture lead to variations in sexual violence. For example, while Korea’s laws and legal system resemble that of others, many of Korea’s legal precedents established and being established by the courts permit sexual violence. Despite these variations in form and degree, sexual violence exists all over the world because it is an experience universal to all women. Sexual violence takes place in all realms starting in the home. The pressures to stay silent and blame the victim are just as pervasive here as in other countries. Additionally, men’s masculinity is measured by their sexual activity while a woman would be shamed for the same behavior. Because sexual violence involves the exercise of power and society’s power resides mostly in men, most of the perpetrators are men. 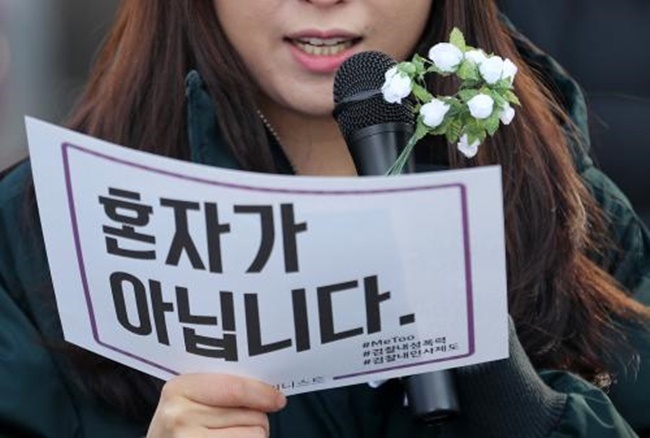 As part of Korea’s legal advances in women’s rights and rising social consciousness around sexual violence, in 2014, a law was repealed which required a victim to publicly accuse the perpetrator to prosecute sexual crimes. This allowed victims to protect their identity and thus protect themselves from a second round of abuse from victim blaming. Paradoxically, this law was possible because women were challenging the social stigma of being the victim and coming forward to fight sexual violence. As regards to the #MeToo movement in Korea, we are just starting to understand its full impact. An initial conclusion is that this movement is ending the culture of victims hiding their identities. The #MeToo movement imbues victims with the courage to reveal themselves and change society. Starting with Seo’s televised interview, many that came forward explained their participation in the #MeToo movement as “I don’t want any more victims after me.” They did so aware of the stigma of being a sexual violence and of the sacrifices required in making a better world. Never have those that discriminate and oppress, of their own volition, realized the error of their ways and relinquished their power and privilege. The #metoo movement is fueled by the desire to build a better world. The first week of the #MeToo movement was unbearable. I was tormented not only by how much those women must have suffered but also by my own innumerable such incidents. Countless women posted about their own similar experiences and about reliving their previous nightmares. That’s why it’s “me too.” Another woman’s experience is like mine because our oppression is so universal. That’s why when one musters the courage to publicly speak about social oppression or discrimination, others also muster their courage and rise up to change the world. As the anti-sexual violence movement strengthens, has its backlash as well? Sure. Historically, every time the women’s movement has strengthened, it has faced backlash in various forms. According to German feminist Alice Schwarzer, when a woman becomes stronger, society emphasizes her physical appearance or motherhood. A still small though growing backlash has been the notion that the #MeToo movement is becoming a witch-hunt. However, rather than concerning ourselves with the backlash, we need to ask ourselves: How will the legal system and courts deal with those women that come forward? How will society protect the victims of sexual violence? How will society punish the perpetrator? How will it deal with the power relations behind the crime? How can we resolve sexual violence? The way of resolving a sexual violence is threefold: heal the victim, transform the perpetrator, change the society that permitted it. However, currently, society is not doing any of these properly. First, we must focus not on ostracizing the perpetrator but on educating his transformation and discussing how to transform society and the necessary laws and systems. Thus, we must transform the very conditions of gender and social power that allow sexual violence. This solution can’t just be achieved within one country. Women’s oppression is universal, so must its struggle be international and based on solidarity.